Do you like to write for themed issues and contests? Are you worried you might miss the next submission period of your favorite publication? Track those themes and deadlines! You can find information about upcoming themed deadlines in two places: (1) On our Theme & Deadline Calendar page. (2) When themes are known for a publication, they are listed in a special "Theme Calendar" section on the publication's listing. When themed deadlines are listed, we let you know how many users are tracking that theme. If you have not already tracked that theme (and you're logged in), you will see a link to "Track" the theme. If you are already tracking the theme, you will see a "Remove" link instead. Simply click the "Track" button and you will be taken to a short form where you can enter optional comments (such as a note of what piece you might want to submit). Don't forget to check the "Add" button. You can see the full list of your upcoming tracked themes and deadlines at any time on Your Tracked Deadlines page. Also, you can choose to display past deadlines in the "Display options" box. If you are on the Theme & Deadline Calendar page or on a market's listing, simply click the "Remove" link associated with that theme. If you are already on "Your Tracked Deadlines" page, click the "Update" link for the associated row and then the "Remove" button. You can find information about upcoming unthemed deadlines in two places: (1) On our sports?bet ukTheme & Deadline Calendar page—be sure to check the "Include unthemed deadlines" box. (2) When deadlines are known for a publication, they are listed in a special "Submission Periods" section on the publication's listing. 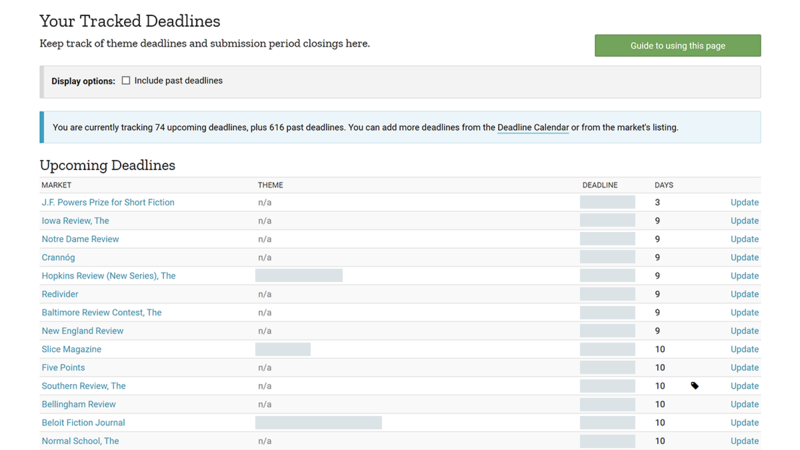 When deadlines are listed, we let you know how many users are tracking that deadline. If you have not already tracked that deadline (and you're logged in), you will see a link to "Track" the deadline. If you are already tracking the deadline, you will see a "Remove" link instead. If you are on the Theme & Deadline Calendar page or on a market's listing, simply click the "Remove" link associated with that deadline. If you are already on "Your Tracked Deadlines" page, click the "Update" link for the associated row and then the "Remove" button. We hope this information has helped you understand how to keep track of themed deadline and submission period deadlines. If you have any suggestions on how we can improve this guide, please let us know.